From the movie title, you will surely know what the movie is about. It has a similar type of theme like the Valentine's Day movie where the story is about different individuals from different types of background and it focuses on all of them but they were all linked to one another as the movie progresses. 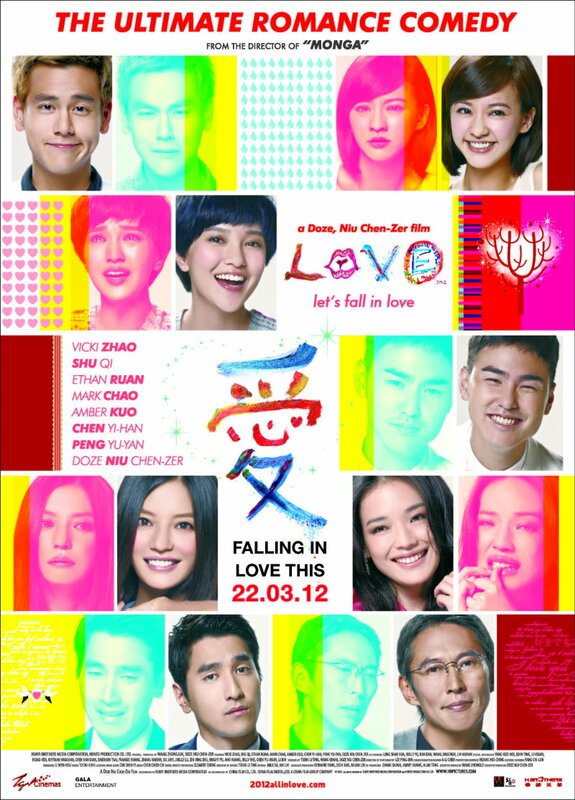 The movie starts off with the story of Ni (Amber Kuo), Yi Jia (Chen Yi-Han) and Kai (Peng Yi-Yan). Kai and Ni are boyfriend and girlfriend but things start being complicated when Yi Jia, Ni's best friend, is pregnant due to a one night stand with Kai. The relationship between the 3 of them started getting rocky but Kai knows that he really loves Ni and tries every possible way he can to get her back. Meanwhile, Ni's father is a wealthy businessman who has a lovely celebrity girlfriend, Zoe (Shu Qi). Zoe is used to a lifestyle of leeching on rich man's money so she never has to work and lives a life of a socialite. But she's not happy with such a lifestyle and when she met a hotel waiter named Kuan (played by Ethan Ruan) who's also Yi Jia's brother, she's enticed by his caring personality and unselfishness even though he has a stammering problem. With Kuan, she feels she can be herself and am able to stand on her own two feet without any help and it feels like home which is great. But does she wants to stay with Ni's Father, Lu or pursue the life that makes her happy? Moving on to another 2 individual, Lu's business partner, Mark (played by Mark Jau) is a work driven successful and charming person. One day, he wanted to purchase a traditional Chinese courtyard home in Beijing. That's when he met Xiao Ye (Vicki Zhao), a single mother who's working hard as a real estate agent with her quirky ways. After a few exchanges in contact from the both of them, they both became enemies to each other but somehow, Xiao Ye's young son seems to bring both of them closer together with the many encounters they face due to happenings to her son. This movie is not only a romantic love story, but it's also a comedic one. The director is Doze Niu Chen Zer who also played as Ni's father, Lu. The idea of the movie was a heartwarming romantic comedy which realistically portrays the lives and relationships of people from China and Taiwan, a movie which explores the warming relationship between these two cities. It also tries to convey that love is not selfish and that it puts the other person's happiness above their own. This movie contains a combination of two of my favorite Chinese actress, Shu Qi and Vicki Zhao Wei. That's why one of my favorite movie is So Close which stars both of them. Despite the movie not being that great, but somehow with both of them combined in the starring role, it makes an addictive movie to me. With the haunting sounds of my favorite singer Corrinne May singing Close to You in the movie, it most definitely propels the movie So Close to one of my favorite. Anyway, back to the movie Love, it started off with a bit of confusion from me (expected since it's trying to develop the story with so many different characters and it's in Mandarin) but after 1/3 of the movie, you grow to know the characters and the hardships they're facing. As usual, Vicki Zhao Wei never fails to bring a smile to my face. The movie in the end did turn out to be a heartwarming one where I grew to love the characters and although I wasn't very fond of the simplicity of the ending, I do give it credit to being a good movie to watch with a date. I rate this movie 3.5 stars out of 5. Oh, what the heck. With Shu Qi and Vicki Zhao Wei inside, I'll give it another 0.5 stars. 4 out of 5.